My sister Annie, came over last night waving this recipe in her hand. She gave it to me and said someone at school had made it and it was, (in her best Long Island accent) "to DIE for". I decided I would look it over and see what my initial thoughts were on it. I never usually use recipes I didn't write up myself or majorly tweak to my liking, but it did appear interesting. I mean the name alone mixes my mind up. Anyway, after I got my stuffin' muffin on, I decided I was in full on Thanksgiving mode and should try it right away. I will admit the directions were confusing. I do not know if they originally were, or perhaps my sister was scaling the walls of her classroom while typing it. I will try and rewrite the directions in a simpler, more sensible manner for you. On the recipe it states that it is "plenty sweet" so whoever made it didn't add the full amount of sugar for the topping, but I just tried it with adding the full amount and I do not think it is sweet enough. I have a love hate relationship with pumpkin as it is, so the sweeter the better. I like pumpkin pie, I feel obligated to eat it every Thanksgiving but in retrospect, I think I have been living a lie for at least the last 15 years. I am not a fruit eater and generally only like pie if it is proceeded with the words, "french" and "silk". 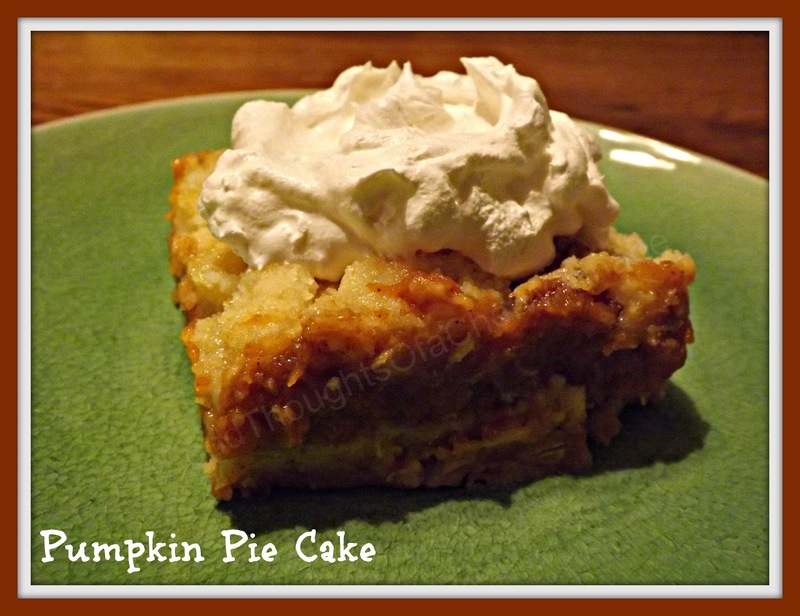 None the less, this is delicious for the pumpkin pie lover. It is a definite twist on tradition and I am going to write this recipe up as a definite should try. No pumpkin pie crust left on the plate! My husband adores pumpkin pie so he will likely love this with a love he has never known before. It is really the same as pumpkin pie, just delivered in a different "package" than your traditional pumpkin pie. Combine thoroughly and pat into bottom of pan so its all covered. Can see the 3 layers here, in case the recipe is to confusing! Mix until well combined and pour over bottom layer (crust). Mix with a fork. Mixture might be wetter than you think it should be especially if you use melted butter, but it is fine, trust me!!! Now sprinkle or dollop it over the pumpkin mixture. Bake for 45 minutes. Let cool completely before serving. Make sure to whip some sweetened heavy cream or serve with cool whip. I hope you enjoy! Make sure to make a test batch! You will be glad you did!